The Adventures of Megan Kathy Grace: FOOL FOR LOVE OPENING! 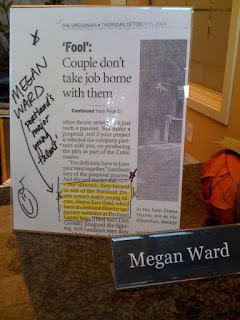 My boss put that up the day the preview article from The Oregonian came out. That way everyone who came into the office could see it. Thanks Kristin! Check out our fabulous preview from Mr. Marty Hugley from The Oregonian. Thanks Marty! And last night we participated in Free Night of Theater with PATA's help. It was amazing to have a full house on our first advertised Preview, but I had never seen many of these people before. People come back to the theater even when it's not free it's still totally worth it!! I promise! I'm very ready for the show to open tonight. I think we all have done some amazing work and I look forward to having people see it and celebrate in the lobby proceeding the show. AND...that's all I got because I'm super tired. I can't wait to sleep in tomorrow! Just 84 minutes from now till opening -- the official countdown is underway! Break a leg, MKG. By the by, I noticed I was somehow DUMPED from your followers list -- inadvertently, I am so sure -- but I'm sorry to have lost my #1 position there. Never mind, now I'm lucky #13; how's that for seasonal?